Plateau’s Problem: Soap Films, or Bubbles with Boundaries. Given a simple closed curve C in three dimensions, prove that there is a surface of minimum area having C as its boundary. This problem was first posed by Joseph-Louis Lagrange in 1760, but it is named for Joseph Plateau, the Belgian physicist who experimented extensively with soap films. Mathematically, the problem falls within the ambit of the calculus of variations. 1. Soap films are made of components that are smooth surfaces. 2. The mean curvature of each component of a soap film is constant. 3. 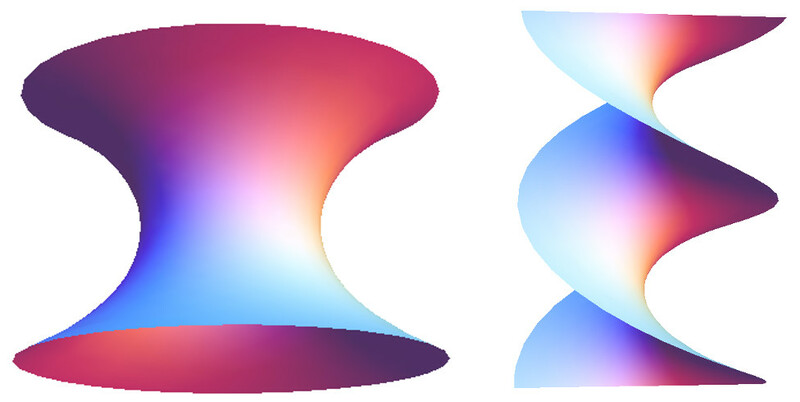 Soap films connect in threes, along curves meeting at angles arccos(−1/2) = 120°. 4. These curves meet in groups of four, at vertices with angles arccos(−1/3) ≈ 109.5°. These laws hold for surfaces of minimal area, subject to constraints such as fixed enclosed volumes or specified boundaries. Soap films are tense: they act like a stretched elastic skin, trying to attain the smallest possible area. The curvature of a soap film is related to the pressure difference across the surface by a nonlinear partial differential equation called the Young-Laplace equation, Δp = 4 σ H, where Δp is the pressure difference, σ is the surface tension and H is the mean curvature [Wikipedia: Young-Laplace equation]. Surface energy is proportional to area, and surface tension acts to minimise the area. Thus, soap films assume a minimal area configuration. If the pressure is equal on both sides, then Δp = 0, and there is no force normal to the surface. Therefore, the mean curvature is also zero. If the pressure differs on the two sides of a soap film film, there is a force normal to the surface, which must therefore be curved so that the surface tension can balance the pressure force. Examples of surfaces with zero mean curvature (H = 0) are the catenoid (generated by rotating a catenary about its directrix) and the helicoid (generated by the lines from a helix to its axis). Plateau’s problem was solved under certain conditions by the American mathematician Jesse Douglas in 1931, and independently at about the same time by Tibor Radó. In 1936, Douglas was awarded the first Fields Medal for his work. Recently, Jenny Harrison of UC Berkeley has published a general proof of Plateau’s problem, including non-orientable surfaces and surfaces with multiple junctions [Harrison, 2012]. Plateau’s original problem dealt with surfaces of minimum area without pressure differences (so H = 0) and with boundaries that are simple closed curves. When we consider bubbles, an additional complication arises since there are variations in pressure, and the surfaces contain multiple components connected in complicated ways. With just a single component, the solution is a spherical bubble. 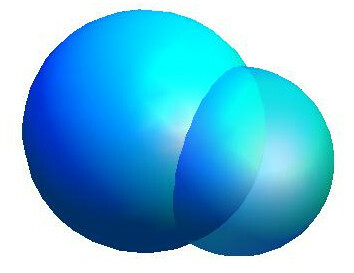 For a double bubble, there are two spherical outer surfaces joined by a spherical inner interface. A cross-section of a double bubble is shown below. For a static solution all forces must be in balance. At point P, three forces of equal magnitude in three different directions must sum to zero. The only way in which this can happen is if they meet at angles of 120º. This result also follows from a physical argument: for balance of the forces at the interior interface, the pressure difference p1 – p2 must equal the surface tension, proportional to the curvature 1/r2 . But p1 is proportional to 1/r1 and p2 is proportional to 1/r3 which leads to the desired result. The double bubble comprising three spherical caps is the minimal surface enclosing two fixed volumes of air. Surprisingly, this was just a conjecture until it was proved as recently as 2002 [Hutchings et al, 2002]. Harrison, J., UC Berkeley, 2012: Soap film solutions to Plateau’s problem, ArXiv: Abstract. H. A. Schwarz, 1884: Beweis des Satzes, daß die Kugel kleinere Oberfläche besitzt, als jeder andere Körper gleichen Volumens. Nachrichten Königlichen Gesellschaft Wissenschaften Göttingen, (1884) 1–13.